By now you’ve probably heard about the benefits of getting outside and exploring nature. For kids, the benefits of spending time outside are even more powerful: reduced stress, increased self-confidence, and a strengthened connection to the living world. Research in psychology and health continues to show that kids are happier and less hyperactive when they have a chance to stretch their legs, catch bugs, and climb trees. Some studies have even shown that children treat each other with more compassion. The effects are so impressive, that some health care providers have started prescribing visits to parks to improve children’s health. It may be the case that “in every walk with nature one receives far more than he seeks,” as the naturalist, John Muir, said. But in our busy lives, it’s not always easy to get away. A walk in the woods often requires preparation and a free afternoon. And many kids are all but glued to their screens and devices and will prove to be grumbly, foot-dragging hikers. We know that nature is good for the minds, bodies, and souls of our growing children. But how do we get kids to love nature and want to spend time outside? Here are five ideas to try. Of course, every child is different and not all of these ideas will work for everyone. It might take some patience and creativity to get them excited about getting outside. But, for a child growing up in our increasingly structured world, a connection with nature can be one of the most meaningful gifts you can give them. Here are five ideas for helping your kid to fall in love with nature. When you think about nature what comes to mind? Are you imagining towering mountain ranges, crystalline glaciers, or a dense, old growth forest? We tend to equate nature with these powerful landscapes: beautiful, wild, and hard to visit. Places like that are certainly worth visiting. But if you want to make “Vitamin N” part of your child’s regular diet, you’ll need to find ways to find and enjoy the nature closer to home. The natural world isn’t all or nothing— it can be found in your neighbourhood park. It can be helpful to think of nature experiences as existing on a spectrum. On one end of the spectrum, you have a camping trip in the Rocky Mountains, for example. On the other end, you have small but frequent encounters with the nature in your neighbourhood, such as bird watching in your backyard, or watching the antics of a busy squirrel. 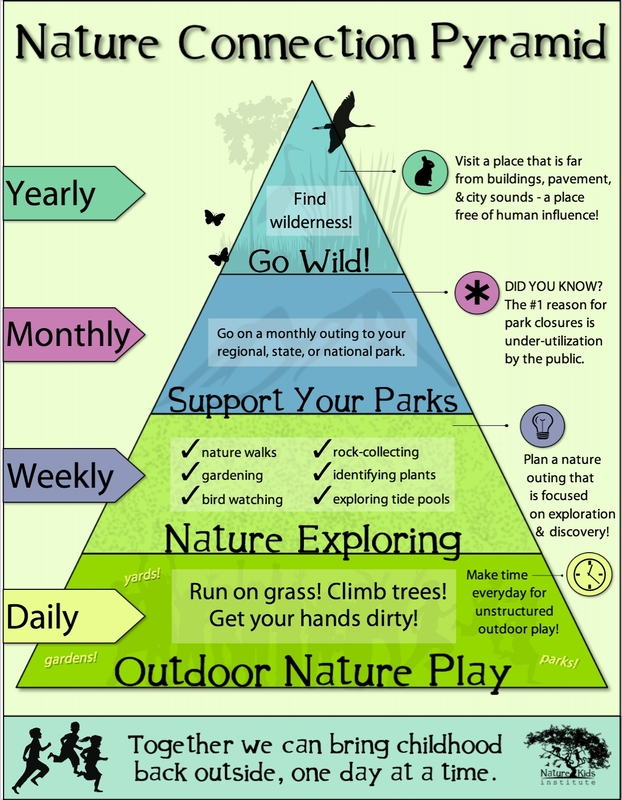 The Nature Kids Institute created the “Nature Connection Pyramid” in order to illustrate this idea. As this infographic illustrates, there are many different ways to get kids out in nature and not all of them require special gear and advanced planning. Think of it as a “choose your own adventure”, where you can select the level of activity that best fits your child’s age and interests. You might make a weekly trip to your nearest park while planning for a bigger seasonal trip to a provincial park. 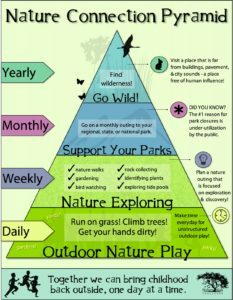 However you choose to engage with this nature pyramid, it’s nice to know that there are options and that, for kids and adults alike, having many, frequent encounters with the nature in and around our cities and towns can be just as rejuvenating as a yearly pilgrimage to a pristine National Park. And it’s good to remember that kids see things on a different scale. To younger children, that small patch of forest in the middle of a neighbourhood park can be a whole world. They are likely to be as thrilled with a small stream as they are with a view of a distant glacier. Indeed, for kids, being able to actually hold and interact with nature is key to their enjoyment. For that reason, many kids will happily swap the views from an alpine summit for the chance to catch grasshoppers in the field beside the parking lot. That may be a bit of an overstatement, but Dr. Sampson has a point. Most kids today have very few opportunities to make up their own worlds, rules, and games. That’s part of the beauty of free play for children, especially outside where the joy of unrestrained movement meets the possibility of imaginative world building. For kids, every stump can be a base, an ally, or a woodland goblin. We all enjoy a sense of freedom when spending time outside. This freedom is all the more precious for children, who are often under the direct control of a parent or authority figure. But in order for kids to engage in this kind of free play, they need a certain amount of freedom from their parents and guardians. Finding that balance between freedom and security can seem tricky, especially for parents who may not be avid outdoors people themselves. One suggestion, again from Dr. Sampson, is to engage in hummingbird parenting. We’ve all heard the term “helicopter parenting”, the practice of allowing children too little freedom to act, fail, and learn on their own. Hummingbird parenting, by contrast, involves giving your children as much space as you can, given their age. For a toddler, you might not be more than a metre away. But for a seven-year-old, you might read your book while they play at the other end of the park. Like a hummingbird, you’ll be ready to dart in should you be needed. You might be surprised how rarely that is. Kids aren’t made of glass (rubber bands, maybe). Scrapped knees and splinters are all relatively harmless and once kids learn that they can and will recover easily, they’ll gain confidence. Use your judgement here, but also keep in mind that when your protective instinct kicks in, it can be easy to overestimate the threat. As humans, we tend to worry too much about risks that are rare but shocking. We worry too much about bears while ignoring the far greater risks of our everyday commute. Media, of course, plays a role in making things seem more dangerous. But it’s worth noting that kids have never been safer in North America than they are today. Of course, it’s still a good idea to go prepared and to take it slow. The right gear for the weather and activity is essential. The good news is that the more time you spend in nature, the more comfortable you and your children will feel. It will be easier to accurately assess safety concerns and to plan accordingly. For example, a familiarity with rivers and currents will help you to determine whether it is safe for your kid to play in the shallows or not. Exposure to mild risk can also help kids to self-regulate and make better choices, as they get older and enter their teenage years. “Adolescents and young adults take more risks than any other age groups”, says Psychology Today. As parents, we can try to clamp down on this risk-seeking behaviour. But we can also get involved earlier and try to prepare our children for the inherent uncertainties of life by helping them to develop autonomy, confidence, and frameworks for assessing and regulating levels of risk. The natural world is an excellent space in which to learn these crucial life skills. The appeal of a long, strenuous hike is often lost on children. 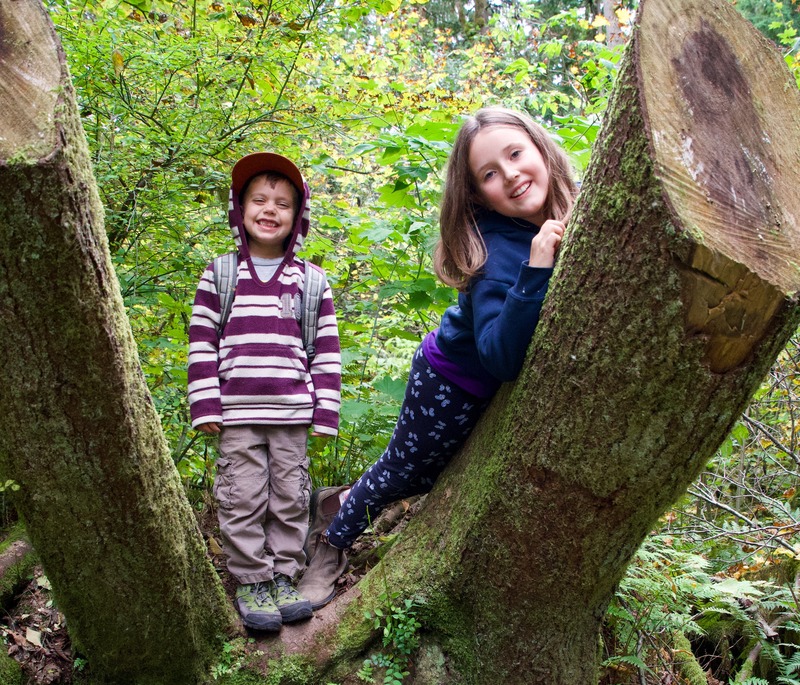 Here in Vancouver, if you visit any of the popular hiking trails around the city, such as Grouse Mountain or Lynn Valley, you’re almost guaranteed to hear the sound of children complaining. Kids tend to enjoy adventures over the work of making it up a hill. It’s all part of that free play we talked about. Picnics are an unappreciated delight and kids love being involved in planning the spread, especially when it includes some of their favourite treats. A short walk to a meadow or lakeside can be a great little getaway on a free afternoon. The woods are full of oddities. Give kids a bag and let them roam about finding cool rocks and sticks. You might think about setting aside a small space in the home as a “Nature Table”. This gives kids the chance to take home and proudly display their neat findings. There are many great nature guidebooks that can help you to work with your kid on identifying their treasures. You might even think about providing your kids with a bug net and a jar in which to temporality house the critters they find. You can take a moment to marvel at the strange bugs they’ve caught before releasing them safely back into the woods. BC has very few insects that are in any way dangerous so children are safe to net what they find. Ready to take it to another level? Consider geocaching, using your GPS device (or smartphone) to go on treasure hunts for hidden objects. Geocaching.com is a great place to get started. Apparently there are over 3,000 geocaches around Vancouver to be discovered. Sure, a glacier might be pretty, but can you march your heroic action figure across it? Can you use buckets to shape it into a castle fit for royalty? Children love sandy beaches, rivers, and streams because they can shape and interact with these environments directly. In other words, they like getting their hands dirty. Why not dress them in some old clothes and let them have at it? Numerous companies also make waterproof mud pants that are designed to get dirty. These sorts of outings are great for small children, as you can sit nearby at a safe distance while still giving them space to splash about and make a big beautiful mess. One of the best ways to make nature part of your kid’s everyday life is to bring it into the home. This can be as simple as growing a plant from a seed on the windowsill of your apartment. Kids relish the chance to be responsible for something and can find a surprising amount of excitement in the growth of a simple snap pea. You can find more ideas for plants that are easy to grow at rainydaymum. If you’re feeling a little braver, you might consider a terrarium where your kids can keep frogs and insects for a day or two before releasing them back where you found them. This is a fantastic way to help your kids to cultivate a sense of stewardship and love for the natural world. Of course, you’ll want to avoid collecting any frogs and salamanders that may be threatened and avoid handling them directly. Books can help kids fall in love with nature. Illustrated guides can expand their knowledge of animals, plants, and ecosystems, while fantastical stories such as The Hobbit, Harry Potter, and The Wind in the Willows, imbue the forests with a sense of wonder. It’s always easier to get out and do things when you’re part of a supportive community. By joining a nature club, you can get the support you need to make nature an intrinsic part of your children’s lives. With numerous parents and volunteers involved, parents can relax and chat, while also keeping a watch over free playing children. NatureKids BC is all about helping children get outdoors to explore, play, learn about, and take action for nature. We invite you and your child to join us for an Explorer Day adventure where we explore tidal pools, forests, and ponds. No Replies to "5 Ways to Help Your Kids Love Nature"